Ron Turcotte became internationally famous in 1973 when he rode Secretariat to the first Triple Crown win in 25 years. In the stretch at the Belmont Stakes, Secretariat opened a 1/16 mile lead on the rest of the field. At the finish, he won by 31 lengths (breaking the margin-of-victory record set by Triple Crown winner Count Fleet in 1943, who won by 25 lengths) and ran the fastest 1½ miles on dirt in history, 2:24 flat, which broke the stakes record by more than 2 seconds. 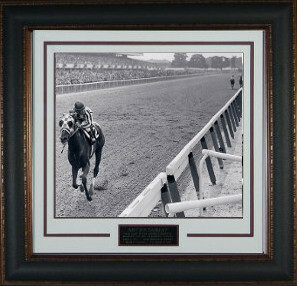 This is Secretariat with Ron Turcotte Vintage B&W 11x14 Photo from the 1973 Belmont with Custom V Groove Matting and Premium Leather Framing.